The Woodland Pinedrop (Pterospora andromedea) is considered an oddball plant that lacks chlorophyll. It's perennial growing from a tight root ball and is parasitic of fungi that occur near trees. I found this sprout emerging from the ground in late July at Misty Beach on verge of Haslam Lake near Powell River, BC. The plant grows in a single stalk from 30 cm to 1 metre tall (11-39 inches). It has scale-like leaves at the bottom and flowers bending down at the top. Dispersal is by seed. There are two guides I use frequently for Coastal BC plant identification. Online I first consult E-Fora BC. It has a great search engine, common and scientific name listings, diagrams, full colour images, and links to other resources. This image for the Pinedrop is an example. 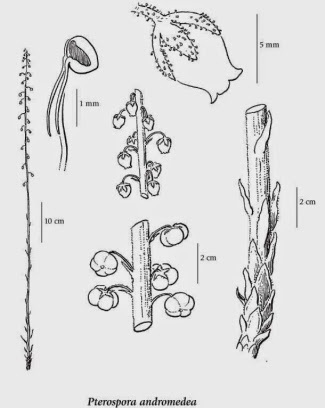 The original image came from The Illustrated Flora of British Columbia. Our next barge and quad ride was a day trip. We met our good friend John (and his dog Bro of course) for road work. John wants to reopen a logging road that's been reclaimed by nature. We left our barge at the Chippewa Bay ramp, but just in case, we landed off to the side in the dry, sandy stream bed. 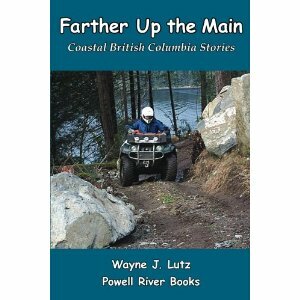 We rode up the maze of logging roads to Heather Main. That part was familiar to us, but getting to the old section of road that John calls "The Donkey Trail" was new to us. Just as we looking around, trying likely spurs, there came John and Bro to save the day. John and his friends have been working on reopening the old road that will connect Heather Main up above to Museum Main down below. This reopened section will save several klicks to reach the Chippewa Bay swimming hole (John swears it's the warmest on Powell Lake) and our cabins in Hole in the Wall. One of the ways nature reclaims roads is by growing alders across the path. The easiest way to keep a road open is to annually trim back the alder shoots. These alders were bigger than shoots, but small enough to remove with clippers. Fallen trees had to be moved. Gullies formed by winter runoff had to be filled with rocks and dirt. Large exposed rocks had to be pried out and rolled off to the side. John went ahead for the heaviest trimming, Wayne followed with the medium sized clippers, and I brought up the rear (with Bro) clearing the trail of fallen debris. I called myself the detail crew member. It was interesting, some sections of the road were in excellent shape, while others had been damaged or reclaimed by the forest. After growing quinoa in my cliff-side garden for six months, it was time to harvest the seeds. I planted in April and removed the seed heads in early September. They recommend not leaving the seeds on the plants once the fall rains begin. That can cause molding before they dry. Unfortunately, only one plant survived due to small critter attacks. I don't begrudge the squirrels, mice, and woodrats a fresh summer salad, but I wish they'd remember to share. I cut the stem below the seed cluster and put it in a basket to finish drying indoors on a windowsill. If you get a larger crop, you can cut the stems longer and dry them hanging upside down. Once the seeds were thoroughly dry, I placed them on a plate. I used my fingers to rub the sees from the stems. I kept removing bits of stem and seed cover remnants until all that remained were the quinoa seeds themselves. One of my garden experiments this year was growing quinoa. It's an ancient grain with recent popularity because it's high-protein and gluten-free. I've eaten it and like the flavour and consistency, so I figured it was worth a try. I wasn't sure it would grow in my small cliffside garden plot. After some research online, I found locally produced seeds at Salt Spring Seeds. If it grows on Salt Spring Island, it might grow on Powell Lake. Quinoa grows in all kinds of soil, but prefers well composted and well drained conditions. The plants grow from four to six feet in height. They prefer full sun. I planted my quinoa seeds directly in the soil in April. Spring rains kept them watered through June. After that I watered every week or two. To space the seeds evenly, I planted them in toilet paper tube rings. Each ring got three or four seeds. Since I've never grown quinoa before, I figured it would help me distinguish my new plants from weeds. On the granite cliff next to our cabin, there's a section where soil clings to the rocky surface. 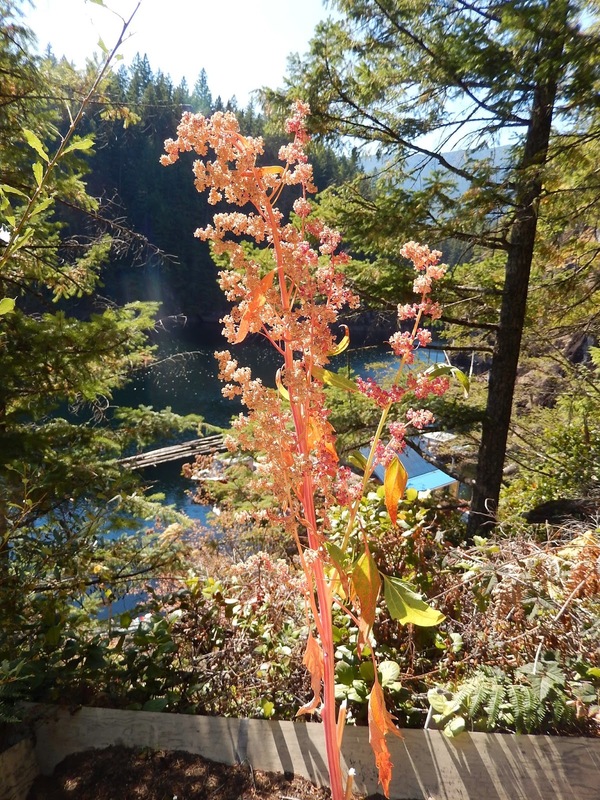 On a narrow ledge, an Oceanspray (Holodiscus discolor) plant grows. Last week I posted about installing anchor cables at our float cabin. One of my readers, Elizabeth, asked how they worked. Storms in fall and winter are the worst. Low pressure systems build in the Gulf of Alaska, swoop down Vancouver Island, cross the Strait of Georgia, and head up Powell Lake. With the lows come rain and high winds. It's the wind that causes the worst damage. We bought our cabin in Summer 2001 and had several weeks of wonderful weather. The next Thanksgiving (the U.S. kind in November), I got a week off from work and went to Powell River on my own. The weather was partly sunny for my boat trip up the lake. Good thing, I'd never driven a boat alone before. Thankfully, John rode in formation to make sure I made it okay. Stiff leg at low water. After a few nice days a storm moved in. The rain was heavy and strong winds made the cabin jerk forcefully back and forth on her ¾” steel cables anchored to the cliff. 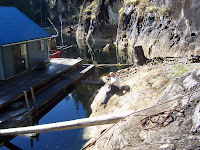 On the backwards swing, the stiff leg (a log that prevents the cabin from hitting the cliff) bounced off the rock, sending reverberations through the float and into the cabin. With daylight, everything calmed. Whew! Cliff anchor bolt with cable needing replacement. The next evening a new low slammed into Coastal BC. The steel cables and their anchor bolts had been weakened the previous night. Just after dark, the wind blown motion of the cabin ripped a steel cable free. With the greater range of motion and stress, another cable snapped. With each gust of wind, the cabin swung far out into the lake, only to snap back, causing the stiff leg to ram into the rock wall. Adding a second anchor cable. The motion was constant and nerve wracking. The lake wasn’t safe to navigate, so there was no way to leave. To say the least, it was a very long night. Fortunately, the remaining cables held and I could talk to Wayne (still in California) via our satellite phone for moral support. You might think a night like this would have scared me away, but I love the cabin, and know John built it skookum (strong) to be safe in all kinds of weather. I was surprised when tomato plants sprouted in my flower planters. Not wanting to look a gift horse (or fruiting plant) in the mouth, I transplanted three to my garden. When they produced I got suspicious. There were two grape tomatoes and one that look like the "vine ripe" ones we get at the market. Then I remembered, I used compost toilet soil on the flowers, and seeds do survive digestive tracts. That's nature's way of planting. I figure, if nature saves seeds, why can't I? I found directions on the web and here are my results. I picked prime tomatoes from the plants and removed the seeds including their gelatinous covering. To remove the covering, I used the fermentation method. Place the seeds in water and leave them in a warm place for several days. A moldy scum will form. Rinse the seeds and put them in fresh water until they rinse clean. I used my finger to stir them in the strainer and pick out any last bits of gelatinous material. Then place the tomato seeds on a paper plate to dry. Do not use an absorbent material, the seeds will stick. I only saved a few from each plant, so I separated them on one plate. Stir the seeds as they dry. They will even stick somewhat to the hard surface of a paper plate. When the seeds are dry, store them in labeled paper envelopes. Fall is when we prepare the cabin for winter. This includes checking our anchors. The 3/4-inch steel cables can deteriorate and weaken over time. Fall’s lower lake level and still warm water makes it a good time to do repairs. Putting the rope in place. This year, we doubled the anchor for our dock. It’s used for our woodshed float and new barge. With that heavy load, a strong wind could snap a weakened cable. Double cables are like an insurance policy. They're available when you need them most. Pulling the cable in place. Our good friend John came helped us with the project. His expertise as an “aquatic engineer” is unsurpassed. Plus, he built our cabin and knows it inside and out. First, the distance was measured and cable ordered with enough extra to swag down in the water, out of the way of props and to prevent breaking under stress. Bringing the cable to the dock. Steel cable is heavy and unwieldy to handle. Wayne and John used a long rope to span the distance from the end of the dock to a sturdy stump on shore that was in a good position to be the anchor point. Once the line was in place, our cedar log raft was used to carry the cable to the stump so John could anchor that end with a loop and cable clamp ratcheted down tight. A turfer pulls in some slack. Then, as Wayne pulled the raft towards the dock, John let out the cable. He was careful not to let it reaches the lake bottom and get caught on snags or logs. As they neared the dock, the pulling became more difficult. Even with buoyancy from the water, the steel cable became very heavy. The cable is "tied" to the dock. When the raft reached the dock, John secured the end of the cable with a rope. This was attached to a turfer, and the cable was mechanically pulled farther out of the water until there was enough slack to attach it to the cedar log that supports the dock. A cable clamp to secure the cable. John wrapped the steel cable around the exposed log and tied in a knot. He used another clamp to connect it together and keep the wrappings from coming undone. Then the loose end was secured with a log staple. Dropping the cable in place. 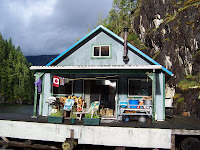 Our next trip with the barge and quads was to the Fiddlehead dock, named for nearby Fiddlehead Farm that produced food for the early Powell River area, a 60's "hippie" commune owned by Mark Vonnegut who wrote The Eden Express, an eco-resort until 2002, then sold again and logged. 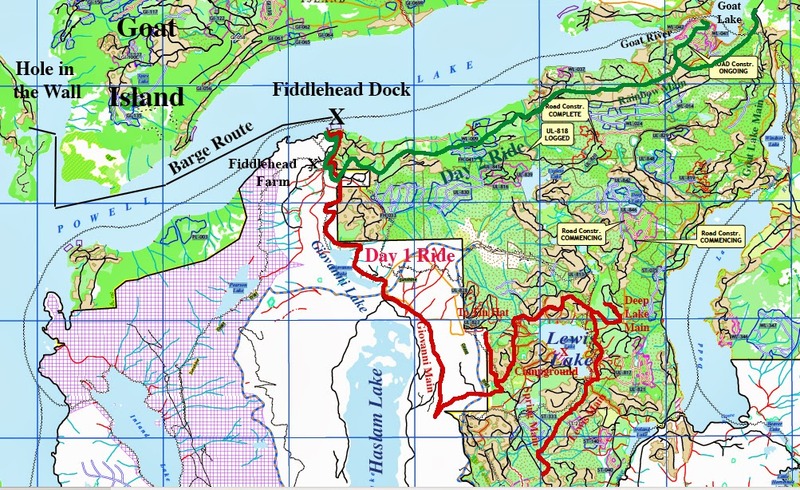 Fiddlehead Farm is a frequent lunch stop for Powell River quad riders. The buildings are gone, but a grassy meadow still has scattered apple trees. I couldn't resist, but the apples weren't as tasty as I remembered. We followed Giovanno (sometimes spelled Giovanni) Main south to work our way over to the Lewis Lake camp- ground. We started up towards the free Tin Hat cabin, but turned back (I'm still scared of steep conditions). We accessed Lewis Main but went around the back side of the lake rather than taking Spring Main to the campground. The last time we rode in this area was 2007. That time we approached from Goat Lake Main using our truck and trailer. Things change and memories fade. We backtracked over the same route with a short excursion up Deep Lake Main. There's lots to explore another day. Camping at the dock was beautiful and quiet. The next morning we broke camp before our ride. Wayne was fueling the quads while I took down the tent. To my dismay, one of the tent poles shot out like and arrow and landed out of sight in about 20 feet of water. That put a damper on things, but the ride along Rainbow Main buoyed my spirits. Years ago I rode Rainbow Main with disastrous results. I was petrified of heights and newly logged sections had very steep drop-offs. Both Wayne and John thought I might never be able to ride again (Up the Main "Quad Acrophobia"). I'm better now, just not 100% as John would say. This time I really enjoyed the views and forest regrowth. Overlooking the mouth of Goat Lake from Rainbow Main. We explored a spur that followed the south shore of the Goat River. Someone has maintained this old logging road, probably to access fishing spots along the way. 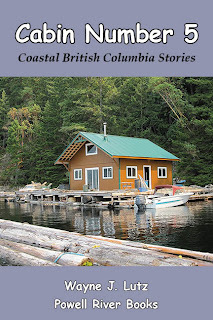 I’m drawn to books about the region where I live (Coastal BC) and especially books about women who’ve chosen a rural or rustic lifestyle. 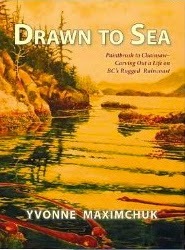 Yvonne Maximchuk wrote such a book, Drawn to Sea - Paintbrush to Chainsaw: Carving Out a Life on BC’s Rugged Raincoast (Caitlin Press, 2013). 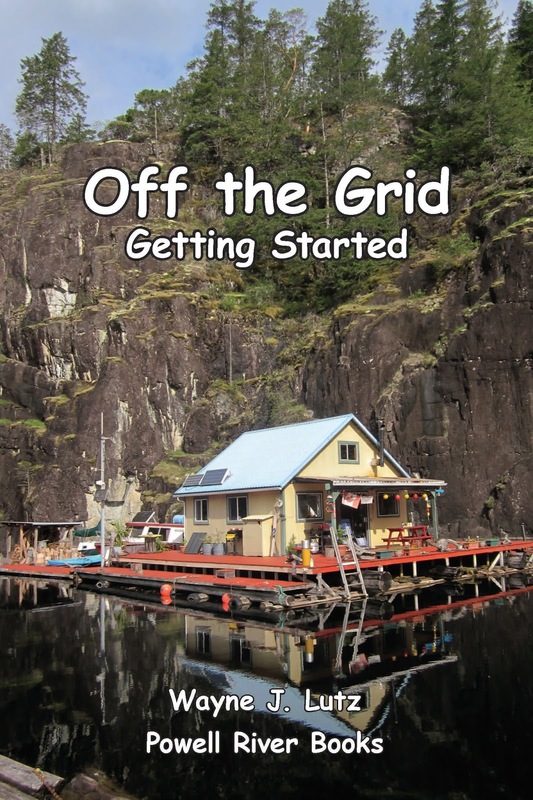 Yvonne learns about wilderness living as she goes: fishing, canning, gardening (her float garden looks much like mine), using a chainsaw (I’m not there yet), and building a house of her own (way beyond my skills). With two kids to raise and take to school by rowboat. I can imagine that each day brought new challenges and excitement. Yvonne met Billy Proctor, a famous longtime resident. 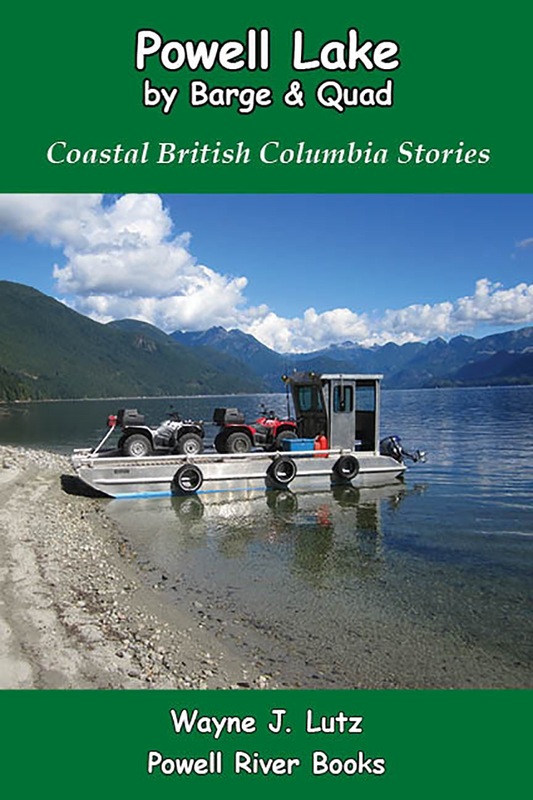 Bill is a hardworking logger and fisherman who welcomes coastal travelers to enjoy his home. He helped Yvonne and Albert (who she later married). Yvonne and Bill became fast friends and fishing partners as well. Yvonne is an artist as well as an adventurer. She uses her speedboat “Sea Rose” to reach majestic locations to paint and draw. The cover of her book is just one example of how she captures the essence of the land and sea she loves. Up on the cliff next to the stairs to the upper garden there is a beautiful plant that hosts lovely white flowers each spring. I discovered it is a wild Mock Orange (Philadelphus lewisii). It's a deciduous shrub that's native to western North America and grows from northwestern California to southern British Columbia. You'll also find it in gardens as well. 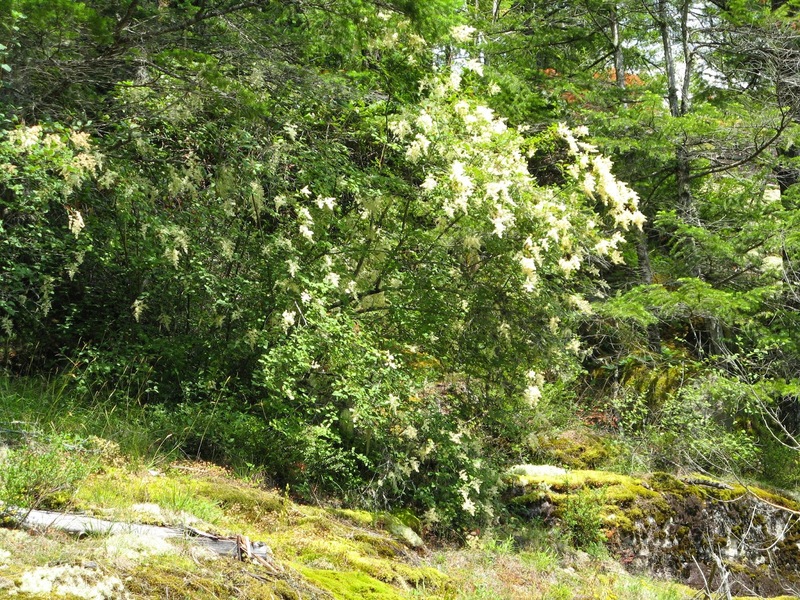 Mock Orange grows from 1.5 to 3 metres tall with pointed, egg-shaped leaves. In early May, small white flowers with yellow stamens brighten up the countryside.